Brentwood offers both Security Strip Shredders and Hooked Paper Shredders for document destruction. 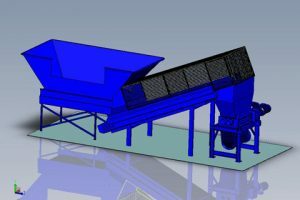 We can incorporate our shredders into complete plant solutions or integrate them into your current plant. Shredding paper is easy right? Well think again. Paper shredding is one of the toughest applications for a shredder due to the characteristics of layered/compressed/bound paper. This material absorbs the energy from the force of the cutters as it compresses until it reaches a shear point and shreds. If the layer of paper is too thick – the shredder will overload. So the trick is to ensure that the shredder receives the right amount of paper for maximum shredding efficiency, but not too much paper that would cause the unit to overload and reverse. Brentwood offers a wide range of hook and strip shredders for secure document destruction. Hook style shredders can be supplied with 20mm, 31mm, or 47mm triple hook cutters. 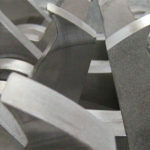 These are a special design cutter for the high loads seen in paper shredding. Output size is the same as the width of the cutter and 50-75mm long. 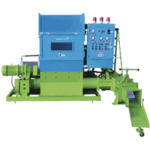 The output from this type of shredder is suitable for baling. 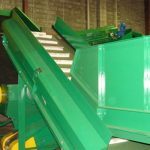 Brentwood also offers a range of security strip shredders as either a stand-alone solution including an infeed conveyor and guarding or as a stand-alone unit to enable integration into an existing plant. 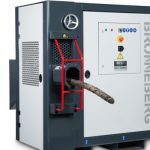 These shredders are designed to strip the material to various widths from 12mm up to 20mm with a rough serrated edge, which is acceptable under most security conditions. 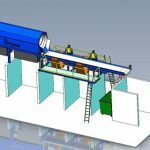 They are extremely efficient and perform at a considerably increased rate per hour compared to shredders fitted with feed hoppers. 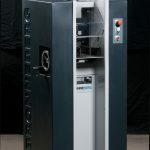 By using a duplicated shredder system, cross-cut shredding can be achieved. Everyone has different requirements when it comes to paper shredding and document destruction. That’s why we specialise in building customised plants. Once we have a clear understanding of your requirements, we will design a plant featuring our core technologies to achieve your throughput and sizing requirements. Shown below are just a few of our plant designs – each with their own unique requirement. Talk to us about how we can design a plant to suit your needs today. 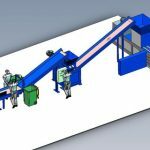 This plant is designed for users who receive their material for shredding in 240L bins. 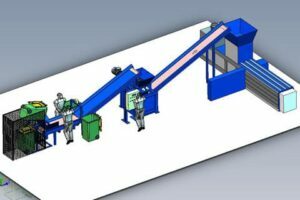 A 2 man sorting station allows for unshreddables to be removed before transfer to the shredder. 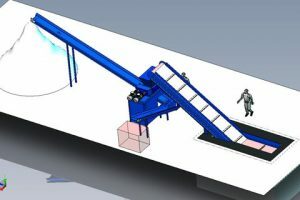 An AZ50HD shredder capable of 2 to 2.5T/hr discharges onto a conveyor to feed a baler. This plant is fed using a pit conveyor to allow material to be pushed onto the belt using a bobcat or similar. An AZ50HD shredder shreds the paper at 2 to 2.5T/hr and discharges onto the main discharge conveyer. 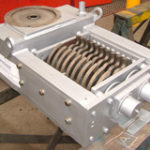 This conveyor can be reversed to route shredded paper to the secondary discharge conveyor. 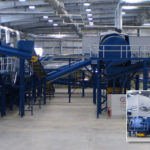 This plant features a small metering conveyor fed by bin tipper which feeds onto a picking belt and then into a Security Strip Shredder with discharge onto a baler feed conveyor. 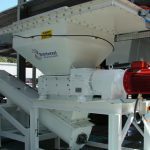 A VSD controlled bulk feeder allows for full bins/cages to be tipped into the main hopper. This feeder slowly advances the paper onto the shredder infeed conveyor to ensure a metered feed to the shredder. Discharge from the shredder is into an air extraction system. Looking for a simple, economical solution to utilise your cardboard waste? Review all of our Security Strip Shredder models.